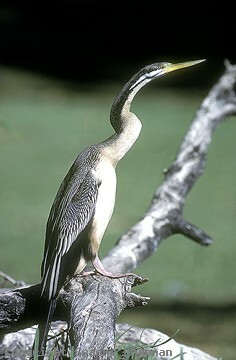 Darters occur all over Australia except for the waterless deserts and closely related subspecies range from New Guinea, Indonesia, the Middle East, India through to Africa. Darters feed largely by swimming underwater to pursue small fish, insects and other aquatic prey. Occasionally they use their dagger-like bill to spear larger fish or even small tortoises and then they have to surface in order to shake them free and swallow them whole. They also swim on the surface with just the head and some neck protruding in which case they are quite inconspicuous. 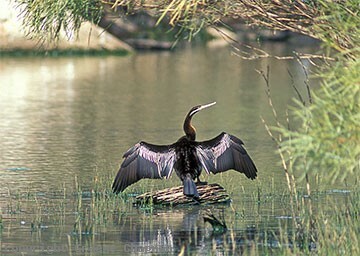 Like cormorants, the plumage of Darters is not waterproof, so they spend a lot of time perched out in the sun to dry out their feathers. They fly straight and strong with the neck tucked in so it isn't at all obvious that they are a Darter and not some other bird. Darters are at home in both salt and fresh water.They build a stick nest in a tree, often overhanging water and usually solitary, just occasionally in a small well-spaced colony. 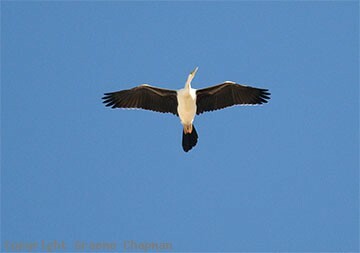 Their loud repeated cackling call (listen on sound page) is one of the outstanding sounds of the wetlands. 101203-D ... 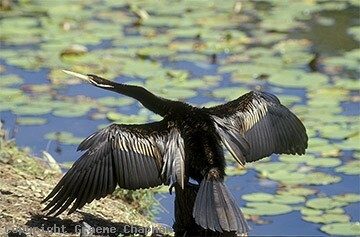 Female Darter in flight.